The holiday season is a wonderful time to honor the dedicated men and women who serve in the US armed forces. This US Navy glass personalized Christmas ornament can be customized opposite the Navy seal with your personal message of gratitude or pride. We'll hand paint your words onto this US Navy Christmas ornament before packing it in a custom gift box for shipping. 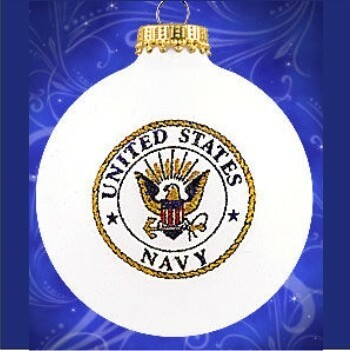 Honor all your family members and friends in the Navy this year with choices from our collection of Navy ornaments personalized for the special sailors in your life. Yearly Ornament Oct 10, 2016 Rebecca S.
Perfect for Son Nov 7, 2014 Darlene B.